Milia seeds are small, white bumps that appear on the skin around the eyes, cheeks and forehead. Seen on both infants and adults, they are caused by clogged pores and sweat glands and are often confused with whiteheads. Milia do not itch or burn and pose no health risk. To get rid of adult milia, you must thoroughly clean your face and unclog your pores on a regular basis with products that are non-comedogenic. 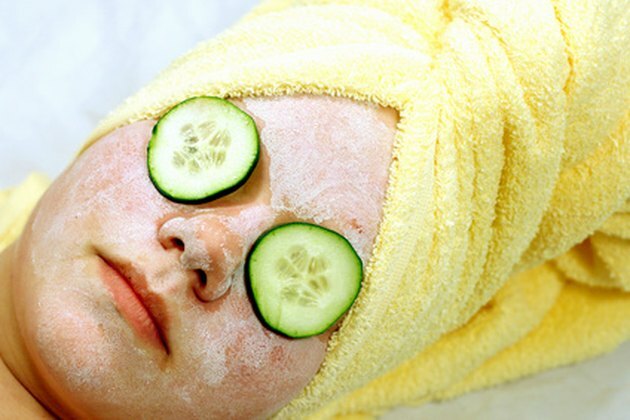 Give yourself regular facials to keep your pores clean and reduce the chances of developing milia seeds. Wash your face with a clarifying cleanser to remove as much oil, makeup and dirt as possible. Clarifying cleansers provide a deep cleaning and will not leave behind any residue. Unclog your pores by holding your face over a facial steam sauna or teapot for at least 10 minutes. Gently wipe away the escaping oil and dirt from your face with a warm moist towel as you steam. Examine your face in a magnifying mirror. Gently lance the largest milia seeds with a sterilized lancet tool. The lancet tool has a loop on one end. Press this loop around the lanced skin to gently force out the contents. Dab the area with alcohol to clean. Apply an oil-absorbing clay mask two or three times per week. Masks containing either rhassoul (red), french (green) or bentonite clay are natural choices that will draw toxins out of your pores. Allow the mask to dry and then moisten it with warm water before you attempt to remove with a washcloth. Treat your face daily with an oil-free moisturizer containing salicylic acid to prevent your pores from clogging with oil.